I would really like to know more about this Masonic ball and it's decorative cover (Masonic Orb Pendant or Fob)? The Golden Ball measures 2Cms in diameter & when you shake it, it makes a ringing sound. The Ornate Cover with the Masonic Symbols appears either to be pewter or Silver (I have not had it tested). Simon: This is an intricate and quality made piece. 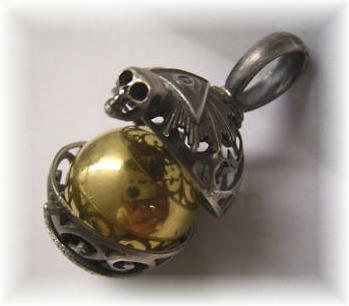 It is called a Masonic Ball or Masonic Orb or Masonic fob pendant. There are many different variations of them with different Masonic symbols on them. Some Freemasons wear them around their neck and others attach them to their apron case. 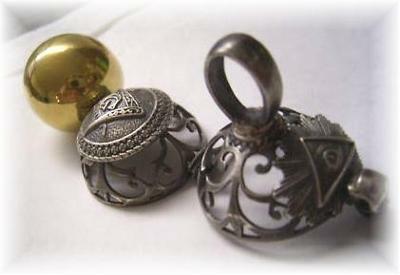 In yesteryears, it was attached as a watch fob to a pocketwatch. Hence, it's many different names. If you wish to sell it, you can usually see some comparable pieces on E-Bay. Some are old/antique and some are of newer origin. If you wish to keep it, you may wish to take it to a jeweler and have it appraised. Does anyone else have a photo of a Masonic Orb pendant with Masonic symbols on it that they would like to share? Just submit it using the form, below. Thanks for writing, Valerie! Great pictures! Good close up pictures really help other people understand exactly what your Masonic jewelry looks like. I have a similar Masonic watch fob that I got from my dad. It includes the chain and a leather carrying case. I would like to know who to contact to get an appraisal. I may want to sell it or donate it to a Masonic organization in my father's name. At the very least I need to know it's value for insurance purposes. I have pictures I could submit. Thanks for any help. Any reputable jeweler should be able to give you an idea of its value. Additionally, you may want to look through the listings on E-Bay to see if you can find one which is similar. That should help give you an idea as to its value.